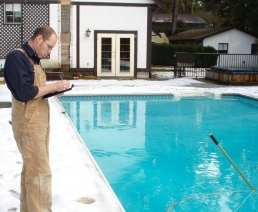 My goal with this website is to create the best, most interesting and most helpful content about swimming pools, hot tubs and water features. In designing the content structure one of my requirements was to create compelling and unique articles that I, personally, would find interesting. For example, I asked myself what the most iconic swimming pool failure in history was...or is there even such a thing? At first I was thinking along the lines of perhaps a famous person who built an extravagant pool only to have it fail or the contractor to go belly up (or missing) during the construction phase. What I ended up finding was so, so much more interesting than that. In and around the year 800 AD an enormous series of temples were constructed, or at least started, across an area of 400 square miles in an area of Asia known today as Siem Reap Cambodia. What is specifically noteworthy about this is that this city of temples was not just big. For hundreds of years the city of Angkor was one of, if not the largest city in the world, being home to as many as a million people. Researchers estimate that the "downtown core" of Angkor could have housed as many as 500,000 people alone. During this same period of time, for example, London had perhaps 20,000 to 25,000 people. Around the year 1200, Angkor Wat, the largest temple in the Angkor grounds, was constructed and this represented the peak of population of this ancient city. By 1500 the entire Angkor complex, the city, the people and all the temples were deserted and overgrown by thick Asian jungle and lost to the world for another 300 years or so. So what happened that caused Angkor to go from being the largest and busiest city in the world to being a literal ghost town? You have to keep reading to find out. I can't tell you yet, except to say that it has something to do with water. But first you need to understand a little more about what makes Angkor, and Angkor Wat special. To help you picture this better, just imagine a small city, and that city is filled with 1000 stone temples ranging from small, all the way up to and including the largest religious monument on the planet. This is set in an area of the world that never gets cold, and experiences seasons of drought followed by seasons of flood and monsoons. Right in the middle of the city is the Angkor Wat temple, which is surrounded by water on all sides. Actually, it is more interesting than that. There is a specific reason why so many people came to live in Angkor during the period of time from 800 to 1500 or so. 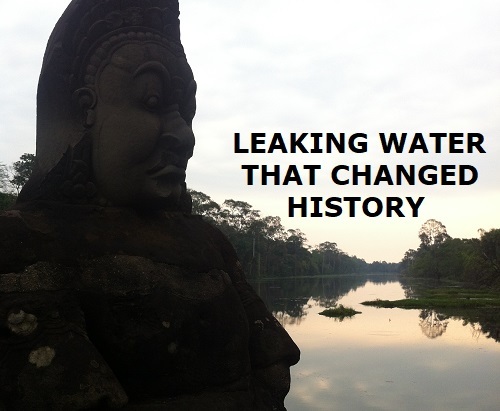 This is because the ancient builders and owners of Angkor had a very advanced (for the time) understanding of how to manipulate and store water. In an area that is flooded half the year and in drought the other half, the ability to control water literally meant the difference between life and death. When the temperature is 104 degrees Fahrenheit (40C) with 70% to 100% humidity, you are not going to make it for very long without water. Also you won't make it very far if you do store water, but do so improperly and it makes you sick or kills you. This was the magic of Angkor and the reason why people flocked here - to live in the relative security of a place that had access to water all year long. 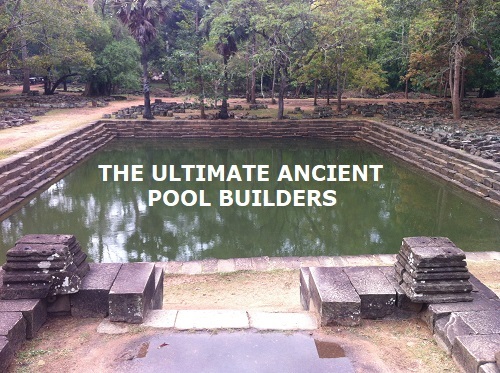 You might be thinking that the Ancient designers and builders of Angkor might have developed agriculture, drainage ditches, holding pools and similar elementary water control measures, and you would be right...but you would also be vastly underestimating the majesty of the accomplishments of these skilled builders. Aside from the fact that the architecture size and scope alone would attract millions of visiting people per year as it does, you need to realize the level of water control of these people is almost unbelievable. 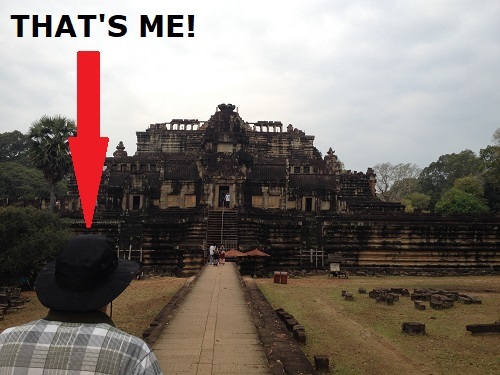 Remember Angkor Wat, the grand temple situated in the center of the city that is surrounded by a giant moat? Indeed it is not surrounded at all. The entire Angkor temple, 500 acres in total, with stone monuments standing at peaks up to a towering 699 feet tall...is all floating on a permanent, manufactured swamp land. 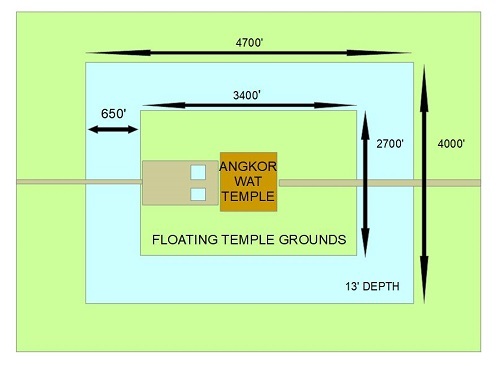 The entire Angkor complex is essentially floating on a permanent swamp. The ground under the stone foundations is sand which remains damp year round fed from ground water and irrigation systems. This system has allowed the Angkor complex grounds to survive for almost 1000 years while being exposed to constant flood and drought conditions. This system that has existed for so long is actually under threat of new problems due to unrestricted building of mega-hotel resorts in the immediate area around Angkor. These hotels are tapping into and changing the ground water table in this area and it is feared that the 1000 year old wet sand foundations under the Angkor floating grounds will begin to dry, crack and crumble. 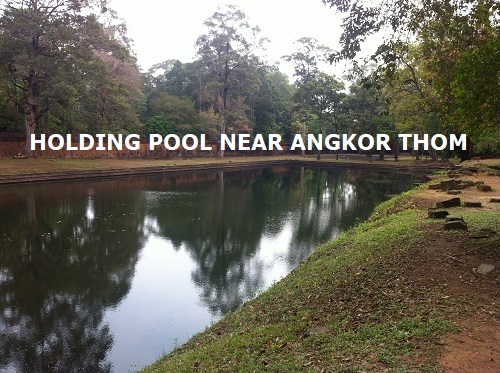 The engineering of the Angkor Wat grounds was designed to work with water, as opposed to against it. With grounds that can deviate between flooded to fissure-cracked dry how could you ever build any type of foundation or permanent structure? The answer was to dig down and excavate the grounds where Angkor Wat would be completely. This was actually done also because the nature of the build site was to be a holy grounds, or holiest grounds more accurately, and so all the ground had to be removed in order to be pure. A bed of sand was installed upon which the permanent structure of Angkor Wat would be built. This sand was intended to remain wet at all times, allowing for a stable, or at least consistent, build site. 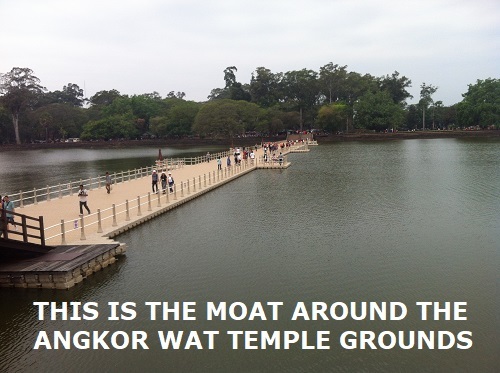 So long as the ground water kept the sand wet then the grounds of Angkor would remain intact. During the dry season the ground water would not be sufficient to maintain the desired moisture of the sand substrate below the foundations of Angkor Wat. 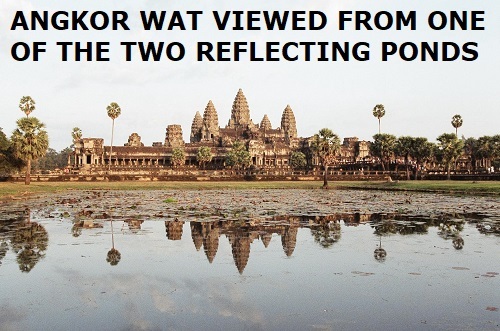 This is why a massive reservoir, or moat really, exists on all sides of the Angkor complex. This moat collects all runoff from the temple grounds and protects the sand from drying out, even during the hottest and driest parts of the year. While building on a swamp is not ideal, how else could you build in an area with such seasonal variation? In essence, Angkor Wat was built like a ship, floating on a swampy, sandy ocean. This amazing feat of 1000 year old engineering exists even to this day, more or less unchanged, and would continue long into the future if the ground water tables are not drastically changed by unrestricted development, as is the current case in Siem Reap. You really need to stop and appreciate the grand scope of this entire empire. Through complex water catchment systems they collected and diverted water for use in growing rice and providing for livestock. These same water systems were used to create water courses that traveled throughout the Angkor kingdom, but most specifically back to sandstone quarries 20 to 50 miles away. These waterways were used to transport between five to ten million stones, some weighing as much as 3000 or more pounds each. The stones were transported to the Angkor site by floating them down these constructed canals. Truly from design to construction to population growth every aspect of this amazing culture was built on the back of water mastery - where the ability to control water meant the difference between life and death. The system of reservoirs, embankments, moats, dykes and dams stretched over an area of almost 600 square miles (1500 square km). This massive water containment system, easily the largest and most advanced in the world at the time, allowed the city of Angkor to flourish from its start in 800 AD up until the 1300's. Over time as the population of Angkor grew and the water system grew more and more complex, there passed a critical stage of no return where the size and complexity of the system outgrew the ability of the people residing there to maintain and repair these systems. By the time the floods of the 1300's came, the city of Angkor was already straining the aging water systems that sustained their existence. Periods of intense flooding, the likes which had not been experienced in that area of the world for hundreds of years, brought about the beginning of the end for the inhabitants of Angkor. Researchers conclude that unusually high water tables caused ditches, rivers and reservoirs to overflow. There were attempts to shunt the flow of water but the volumes were not able to be controlled. Moats overflowed, fields flooded, rivers widened and found new paths of least resistance, and the system that had brought a million people together finally broke. Despite manpower in the hundreds of thousands, and resources and riches beyond imagination (such as Preah Khan temple which contained over 60 tons of gold, worth over three billion dollars by modern standards) there was no way to fix the damage done by flooding and ultimately entire vast sections of the network were damaged beyond repair and abandoned. Even attempts to fix parts of the complex hydraulic system that had taken hundreds of years to build failed due to the size and complexity of the system, and the state of deterioration from both age as well as flood damage. Despite the best advice from Jeff Goldblum, life, uh, didn't find a way this time. In fact the population of the Angkor area plummeted due to the loss of ability to control water, grow crops and survive the dry season. Also the faltering city became susceptible to attack from warring neighbors, and by the beginning of the 1400's Angkor Wat and the entire empire of Angkor were a shadow to the majesty they once were. Raiders infiltrated the once safe lands, and the jungle stole back the land it once occupied at an amazing rate. Already broken and battered there was no line of defense left against the next disaster to befall this once glorious place. Two periods of unprecedented drought, each one 20 years long, were what the last remaining survivors of Angkor experienced in the 1400's. By 1500 only a skeleton crew of devoted monks remained to honor the holy grounds of Angkor Wat. All others had died, been captured or fled the area in search of stable water. Eventually the entire landscape of Angkor became lost to the jungle, overgrown and deteriorating with the earth slowly reclaiming the resources back into the landscape, until the late 1800's when a French explorer stumbled onto the apparent ruins of some great city in the middle of a dangerous and sweltering Asian jungle. The ruins of Angkor Wat - a great civilization brought to its knees and destroyed by the worst swimming pool leak in history. As soon as I read about the epic story of the rise and fall of one of the greatest ancient civilizations, all on the back of water mastery, I knew what I had found. This is the greatest example in history of how the slow erosion of water was the downfall for some of the greatest water masters that have ever lived. Indeed an entire empire was built by the ability to control water, to work with it as opposed to against it, and to build on it even...only to one day lose control and crumble completely. But was the writing on the wall for this downfall from the beginning? I went to this ancient ruin to see it, and learn about it, and ultimately share it with you - my story about the worst leaking swimming pool in history. Now THAT is a real commitment to quality content and if you enjoyed this article please take a minute to like it and share it through social media, and subscribe to my YouTube channel - Cheers and thank you!